Have you ever gone camping, yet found yourself not attracted to the idea of sleeping on the ground? Maybe you just aren’t a fan of it, or maybe the ground is inhospitable because of rocks or nearby animals, or some other reason besides. In this case, an alternative is needed to solve this issue. But what could it be? Simple; truck tents. 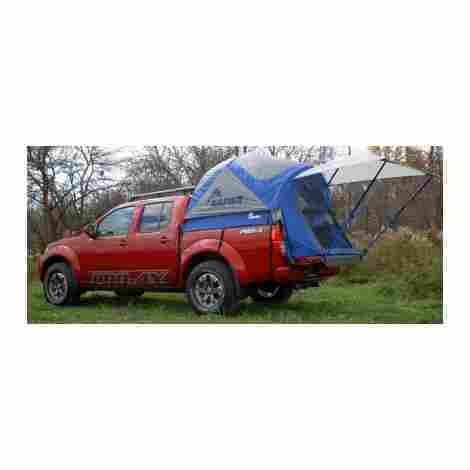 Starting off our list, we have our #1 pick, the Napier Backroadz Truck Tent. You’re going to be seeing a lot of Napier on this list, and for a good reason. There’s just no one else who does what they do as efficiently and as consistently as they do. So, what makes this their best work yet? Let’s find out. Considering the fact that these are seen as the quick and economical alternative to pitching a normal tent, how fast you can actually set the things up is a big deal. As such, this tent wins out because of how quick and easy it is to set it up, regardless of what size you actually have it in. Trust us, this seemingly minor thing will seem more and more like a godsend the further we move along. The idea of sleeping in the bed of a truck already likely has you reeling from how it must feel. Well, unfortunately, most truck tents don’t give you an option between that or at least a floor between you and the truck bed. Except for this one of course, which puts a layer of polyurethane matted floor between you and the cold plastic/metal of the truck bed. The thing you’ll notice very quickly is that these tents come in multiple different sizes. And in the case of Napier, they come in so many sizes that their tent prices, including this one, can range into the tens of thousands. But luckily, the smaller sizes are perfectly affordable, as far as tents go. 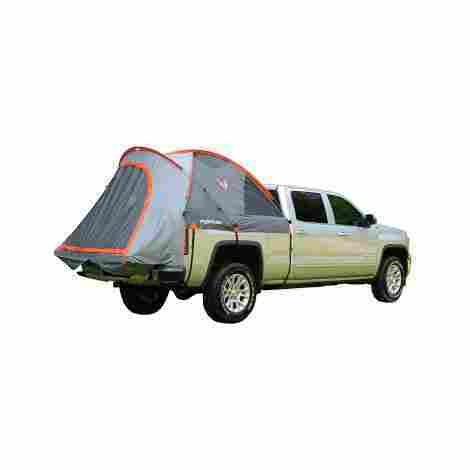 Coming in second place, we have the Kodiak Canvas Truck Bed Tent. Kodiak Canvas have tried multiple times to take the crown away from Napier as the best truck tent manufacturer, and this is easily the closest they’ve ever come to topping the masters. Let’s see how they went about pulling it off. If there is one overriding fear that dominated anyone who sleeps in a tent, it’s bears, but second to that is a rainstorm. Because there is rarely so little way of actually knowing if your tent can take the punishment of an entire rainstorm coming down on top of it. Luckily, this tent has a solution known as Hydra-Shield. This is a 100% cotton duck canvas, built specifically to wick and whether any kind of storm mother nature can throw at it, short of an actual hurricane. Now you may think this to be a bad design since tunnels aren’t exactly known for being spacious. But when you’re in a tent, it stands to reason you aren’t looking for space, to begin with, but beyond that, going for this style allows this tent to have far more headroom than a lot of other tents in general. Unlike Napier, this tent only comes in one size, and thus only one price. And that price, while very pricey if we're honest, is still far more manageable than what the previous entry would ask of you if you went so much as one size higher than the default. And despite the price, you are in fact getting what you paid for. Finishing up our top 3 segment is the Sportz Truck Tent. This a nice, cozier option compared to the previous two entries, able to hold at least two fully grown people. But, of course, that won’t matter if it isn’t up to snuff, so let’s see what else it has to offer. We all forget things in the truck that we end up needing later, but it can be such a pain to climb out of the tent, especially when someone else is sleeping in the tent with you, go to the car, get the thing, then climb back in, all without waking the other person. 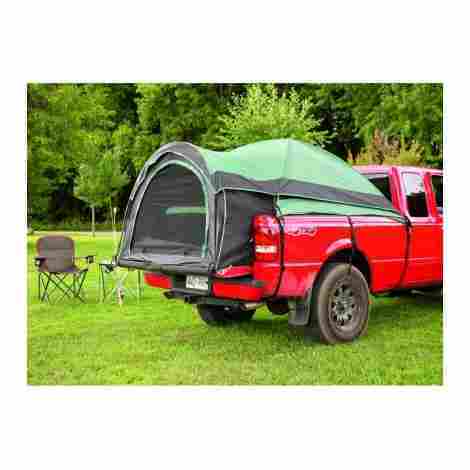 Which is why this tent takes advantage of the presence of the rear panel in the back of the truck. This tent has a little hatch in the back that lets you access anything that you left in the back seat. Guide ropes are a very useful tool for setting up these sorts of tents, but they can also be cumbersome and hard to figure out if you don’t already know what you’re doing. Which is why this tent does away with the need for them entirely, thanks to its 4 X 4 shade awning, which secures by itself to the tailgate. Once again, we have a price range for this tent, and it’s a lot pricier than the first entry. Even at its smallest, this tent will cost quite the pretty penny. Coming in at #4, we have the Napier SportZ Cove. This is what you’re looking for when what you want out of your truck tent is a more casual, laid back experience from your truck tent, free from the long minutes of setup and getting it working. How does this tent accomplish that? Well, let’s see. Let’s say, for the sake of argument, that you don’t have a truck, but a CUV or SUV. 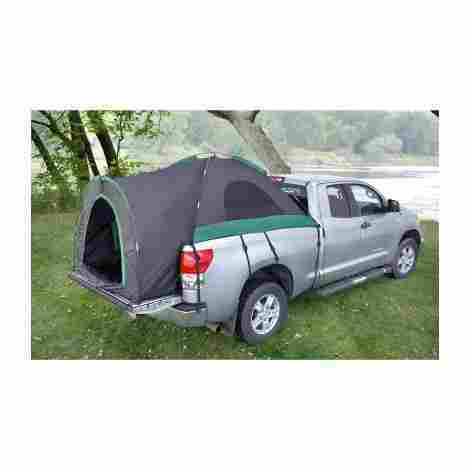 Well, don’t worry about not being able to use this tent, as not only can it make an excellent truck tent, but it can be used for other vehicles like SUV’s as well. 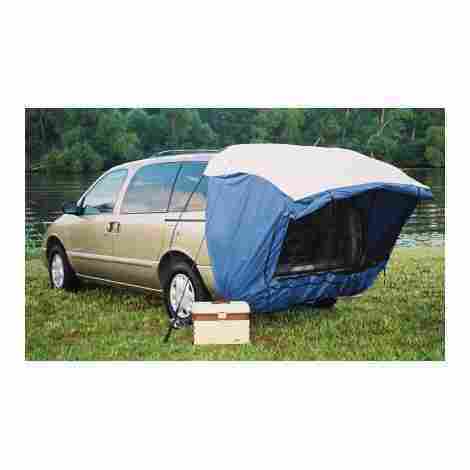 Simply wrap this vehicle sleeve to the back of your vehicle, set up the awning, and you’re good to go. The last thing you want is for your tent to tear. Because now not only is the strong mesh bug screen completely useless, but oh look, it’s raining now, and the inside of your tent now has a huge leak. Which is why this tent constructs itself out of strong polyester taffeta. Not quite as comfy as other forms of polyester, but way comfier. This is actually one of the cheapest entries we’ve seen thus far, and it’s no shock to see why. Because of its primary function as an SUV tent, there really isn’t all that much to its design. Like the name says it’s basically a cove attached to your car. In the 5th place slot, we have the Rightline Gear Full Size Truck Tent. While not exactly the comfiest tent in the world, it is one of the most economical and fastest to put up. Which is great when you’re on a long road trip and need to get in some quick naps while you’re on the road. Now then, let’s see what else it has to offer. This is one of the most secure truck tents on this entire list, and most of that comes from the fact that the means by which you secure a truck tent, the straps and buckles and so forth, are all made from the same high quality nylon that keeps it all nice and secured. All without so much as scratching your car’s paint job. It only makes sense that this tent has a water-resistant coating. But there’s one thing these water-resistant tents tend to overlook; the seams. The seams are one of the most vital areas of the entire tent, yet they’re also the most likely to leak water in a hole-less tent. Which is why this tent makes sure to put a nice layer of tape over those seams, to keep it nice and airtight. Though it has to sacrifice a few amenities in getting to the price it has, such as a floor, this tent still manages to get to a very tempting price tag, which will no doubt draw people to it regardless of that little major drawback. 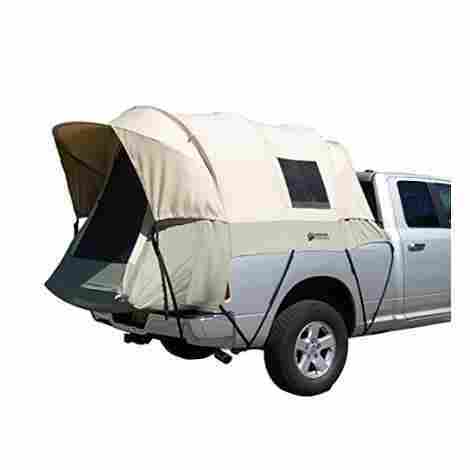 Coming in at #6, we have the Guide Gear Full Size Truck Tent. There are a lot of different things to love about this tent, from the design, to the amount of protection it provides, to so much more. So, let’s not waste any more time and just get right to it. If there’s any part of the design of a truck tent that a manufacturer must get right, it’s the interior. Exterior design is something that every manufacturer worth looking at knows, but it’s the interior design where those manufacturers are really put to the test. Luckily this one more than measure up, providing excellent ventilation without overdoing it, a sewn in polyurethane floor, and complete water resistant coating. With a frame that practically sets up itself, powerful, idiot-proof straps, and buckles that give you no trouble, this tent is a breeze to set up. Which is especially good when you need to set up a tent in the pouring rain, and all you want to do is just sleep. This is, without question, the cheapest entry on this entire list thus far. So, if you want cheap, efficient, and overall excellence out of your truck tent, then this is the one for you. For our 7th place entry, we have the Guide Gear Compact Truck Tent. Like the other Guide Gear entries on this list, this one got here due to its abilities and multiple features. With that said, let’s take a closer look to see what those features and abilities actually are. 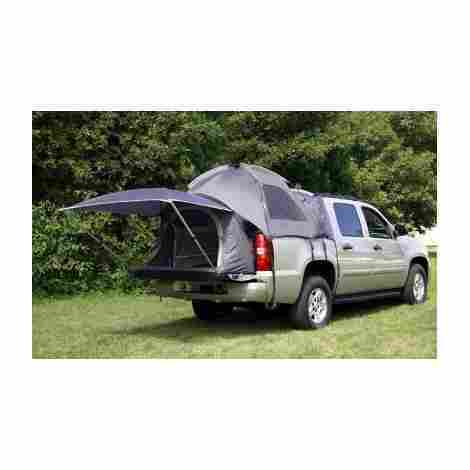 This is, as you can imagine, something that a lot of people who look for truck tents look for is the ability to fit most truck beds in general. This is a lot more complicated than you’d think it would be, considering how, from the outset, they all seem to resemble each other. But for the differing measurements, heights, widths, lengths, and more, this tent will fit pretty much whatever you put it on okay. But maybe your tastes are a tad more refined when it comes to the tents you want. Maybe you need to adjust your tent to fit a certain scenario like low hanging branches. Well for this, the Compact Truck Tent has you covered as well, allowing for total adjustment and customization to suit your needs. And the sizes just keep going down, as we have an even cheaper offering than even the previous one. This is likely the secret behind Guide Gear’s popularity with the camping crowd: they make excellent products, for very low costs. Kicking off our final 3 entries, we have the Napier Outdoor SportZ at #8. The cheap but sturdy models were nice, but it’s high time we got back to Napier, delivering exorbitant prices, but fantastic quality to back it up. But don’t just take our word for it, let’s take a closer look and find out. The main thing that gets in the way of setting up a tent all by yourself is the prospect of having to set up the poles and keep them set up. Which is, fortunately, not a problem with this tent, as its poles are made from a super durable blend of steel and fiberglass, which will stay up no matter what the weather has to say about it. Most of the time, the only place you find a universal vehicle sleeve is on smaller tents that aren’t really whole tents in their own right like this one is. 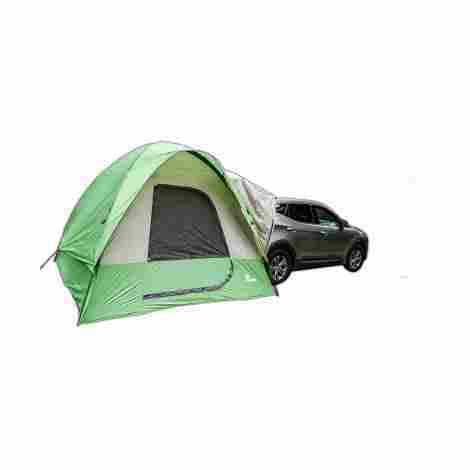 However, this is where those and this tent differ, as it manages to be an entire tent, complete with awning, two layer entrance, floor, and everything else, yet also attaches to the back of your car for easy access to the storage area. Of course, with all that being said, you really shouldn’t expect to be paying anything close to what you’d be paying for the previous two entries when it comes to this one. However, if we’ve proven anything by all this, it is that you are more than getting what you pay for. In our second to final entry, we have the DAC Explorer 2 Tent. Once again, we have a tent that’s meant to be fitted on the back of a car, specifically an SUV or CUV. However, unlike the previous entry, this one has quite a few differences to it that set it apart. Let’s take a look and see what those are. You may not be the biggest fan of the “constantly open back” look of these kinds of tents, which is understandable. Which is why this tent comes with a pair of outer door panels which, besides keep out bugs, can also be tied open for ventilation, or sealed shut for privacy. Perfect for those overnight camping trips by the lake where you need a place to both change and sleep. The eternal bane of the camping trip: bugs. Can’t live with them, can’t live without them (arguably). But whatever you think of them, they don’t really care, preferring instead to bite you for all they’re worth. So, it’s always nice that this tent provides you with a no seam bug screen that keeps all manner of creepy crawlies out of your sleeping space. While still kind of expensive, this tent, is rather simple in design, is nowhere near as pricey as the previous entry, or other entries on this list. For the final entry on this list, we have the Napier Outdoors Avalanche. Once more, we come to a truck tent that fits into the bed of your truck, and in that regard, we believe this is one of the best around. So, let’s see what got this tent on the list, to begin with. The real challenge of setting up a tent comes down to the tent poles used to put them up in the first place. And in that respect, this tent has almost all of them beat. Using color-coded, shock-corded fiberglass for the material to make the poles, this tent is one of the easiest poled to set up on the market. The biggest advantage provided by these types of truck tents is that they generally come with their own awning that lets you sit in the shade and watch the rain or other weather patterns interacting with nature. 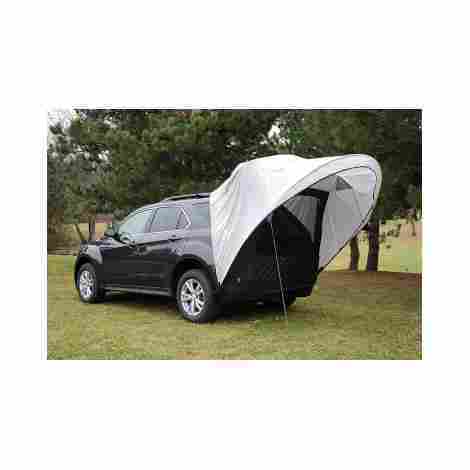 And this awning is one of the biggest, standing at 6X6 ft. that extends off of the tailgate and creates plenty of shade for you and your companion. This tent stands at something of a midsection for this list’s price range. On the one hand it’s nowhere near cheap, but it could definitely have been a lot pricier. For what it is, it’s a pretty decent deal, but it could’ve been a better one. Truck tents cannot hold a candle to a normal pitched on the ground tent. It’s not mockery, it’s simply a fact. Truck tents are emergency tents, meant to be what you resort to when the ground is too inhospitable to camp on, or you’re in too much of a hurry to set up a full campsite, or if there is wildlife around that you should not be on the ground, and thus within pouncing range, to interact with. Now, that is not to say that truck tents are not worth consideration or admiration, because as this list has thoroughly proven, that is simply untrue. Truck tents, in fact, have a lot of qualities to them that make them more than worthy of respect. As we said, they are the quick version, they are proof that tents don’t have to take half an hour just to set up a cloth hut with metal sticks holding it up. There are a lot of things about truck tents with which to base an appreciation, and hopefully, these ten excellent entries have proven that. So, if you need a truly excellent truck tent in your life for that big upcoming road trip next week, then one of these entries should suit your needs just fine. For our penultimate segment for this list, we’re going to be looking at the criteria we used for evaluation of this list. Both what we used to judge what got onto the list in the first place, and once on the list, how far up they made it. This was not as hard as we thought it would be, but then judging a truck tent is the equivalent of judging a normal tent but with some minor alterations. So, if you know what makes a good tent, then you mostly know what makes a good truck tent, so let’s waste no more time. Before we can talk about anything concerning the tents themselves, we need to concern ourselves with one last little detail. None of the other criteria on this list matter, after all, if the tent is refusing to actually fit over the bed of the truck in the first place. As such, one of the most important criteria we evaluated each entry by was how well they adapted to different truck bed sizes (or in some cases SUV cargo spaces). Now, every entry that made it onto this list was doomed at some point, since most truck bed tents come in varying sizes, and will thus not fit every single truck size under the sun. It is simply inevitable that a truck bed size will be too much, so the idea here was to judge just how adaptable each entry was. Simultaneously this became our strictest yet most lax criteria. With that out of the way, we can move on to other criteria for these entries. One such aspect that attracted a particular amount of our attention was the interior design of each tent. Because exterior design is something that we like to think pretty much every tent out there has down pat. It’s pretty easy these days to design the exterior of a tent because everyone else has done it. Now the interior of a tent is a very different story. Not a lot of manufacturers have quite figured out how to balance efficiency and comfort in this area, especially when it comes to truck tents, which have to be cramps and compact purely by design. It’s just the way the things are wired, so to speak. Floor: Both what kind of floor you’re going to have and whether or not the tent has the floor at all. This will usually be in the bed of the truck, or on the ground, so there had better be a floor or you’d best hope you have some very comfy sleeping bags because otherwise, you aren’t going to be sleeping a lot tonight, friend. Ventilation: This doesn’t mean that you should find a tent with its own ventilation shaft system, that would be absurd. What this means is how much air your tent lets in, because this is an important factor to consider. You are, after all, going to be sleeping in this thing all night, and if you don’t have a good enough ventilation, you’re going to be sweating up a storm in minutes. Proper ventilation can be achieved through the number of windows, the thickness of the fabric, among many other factors. Gear pockets: Finally, not quite as important as the previous two, people do tend to appreciate it when their tent comes with a pocket to store all their stuff, so they don’t roll on top of it and break it in their sleep. Or rather, it breaks them first. This is one thing that most truck tents have down to a science, this was still an important criterion for us to consider while constructing this list. Now, we don’t mean danger in the traditional sense, of course. We mean danger more like in how much damage tying so many of those tight nylon straps and buckles to your truck will actually do. Now, again, this was not a hard criterion for the entries that made it onto this list to make it where they did. Manufacturers wised up quickly to the damage these things could do, so they quickly took steps to make the straps and buckles and so forth as harmless to your truck as possible. We’re not sure if you’ve noticed by now, but truck tents are pretty expensive, especially if you want the really good ones. This only makes sense, especially when you consider the really good ones and everything that they have to offer when you use them. If you look through the highest quality Napier offerings, you’ll find what are basically luxury tents that you can attach to the back of your truck, that just cost you shy of everything you own. So, if you want the highest quality materials, treatment, and protection against the elements, then a high price is just something you have to get used to dealing with. For our final segment, we’re going to be looking at the most frequently asked questions about truck tents. Not a lot of people use truck tents, so it only makes sense that there would be a few questions before any talk of purchases is made. And we, as always, are more than happy to oblige on this. So, with that said, here are the most frequently asked questions about Truck Tents. Q: Why should I actually use a truck tent? What are the benefits versus a normal tent? A: Only fitting we start off with the hot-button question. Indeed, offering someone a truck tent over a normal one can seem like a hard sell. But thankfully most don’t even make the attempt, usually just trying to sell a truck tent to truck owners on their own. The keyword here is convenience and safety. For one thing, you will never need to search for flat even ground to pitch a normal tent, since as long as you’ve parked on anywhere, that isn’t an incline, your truck bed will always be completely flat. And secondly, there is zero chance of anything short of a particularly determined bear getting into a truck tent. And even that’s not a fair comparison since a particularly determined bear is pretty much unstoppable. So if that’s all that you’re looking to get out of a tent, then a truck tent pretty much has you completely covered. Q: I’m about to go camping in a particular bug infested area, will this keep out the bugs as well as any other tent? A: As long as you don’t have any bugs in the bed of your truck when you put down the tent to begin with, then yeah, pretty much. It’s still a tent, after all, and thus just as good at keeping out the creepy crawlies as anything else. In fact, in some cases, it’s better at that since it’s more compact and thus fewer areas for seams to form. However, then comes the big problem with all tents: the fact that the responsibility rests on you to keep the mosquitos out as much as you possibly can. See, the thing about being airtight is that opening and closing a door over and over tends to change that somewhat. So be sure to open and close your tent as little as you possibly can, so as to not give the little bloodsuckers any chance actually to get in. Q: Do I have to put this thing together in the bed of my truck? 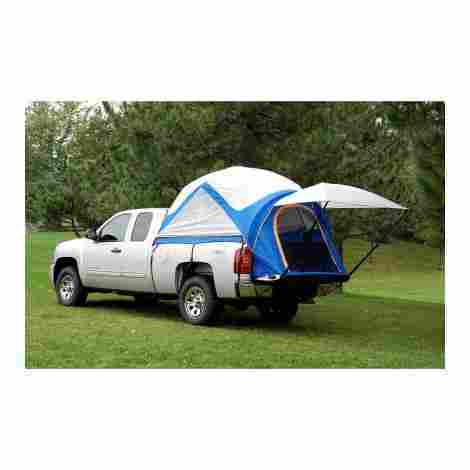 A: Don’t worry, you don’t have to put together and pitch a tent in the tight, enclosed bed of your truck. Pretty much all truck tents (i.e., everyone on this list) can be put together on the ground, then all you have to do is put it on the truck. And all that boils down to is some strapping and buckling. Now it should be said that you can assemble your truck tent in the bed of your truck and skip the cumbersome lifting process. However, we really don’t recommend it. It’s even more cumbersome, irritating, and if your car is parked near a rock, and you fall off, then you are going to wake up in the hospital not remembering your own name. So yes, while it is, in fact, possible, we recommend you do yourself and everyone with you a favor and keep it to the ground. Your pride will survive.